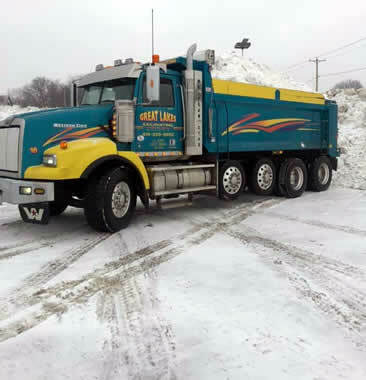 Great Lakes Excavating offers a full service snow removal service. We know that Wisconsin winters can be unpredictable and we are always on the job when you need it. We are dedicated to customer satisfaction and job quality. Our team of snow management experts are always ready to clear your lots or pathways professionally and as quickly as possible. Whenever your company or property needs the best snow removal, parking lot clearing, sidewalk clearing or salting in the Milwaukee area then this is your one stop shop for all of those services. We take pride in being the very and we guarantee that you will always be satisfied. Here at Great Lakes we use state of the art equipment to improve productivity and efficiency which means lower prices for you. We offer a 24/7 emergency service to ensure your pathways and lots are always clear to provide safety for you, your workers and your clients. © Great Lakes Excavating, Inc. A Milwaukee Based Excavating and Trucking Contractor. All Rights Reserved.